I did it. Yesterday I waded into freezing cold water just for the fun of it. OK so there was more to it than that. 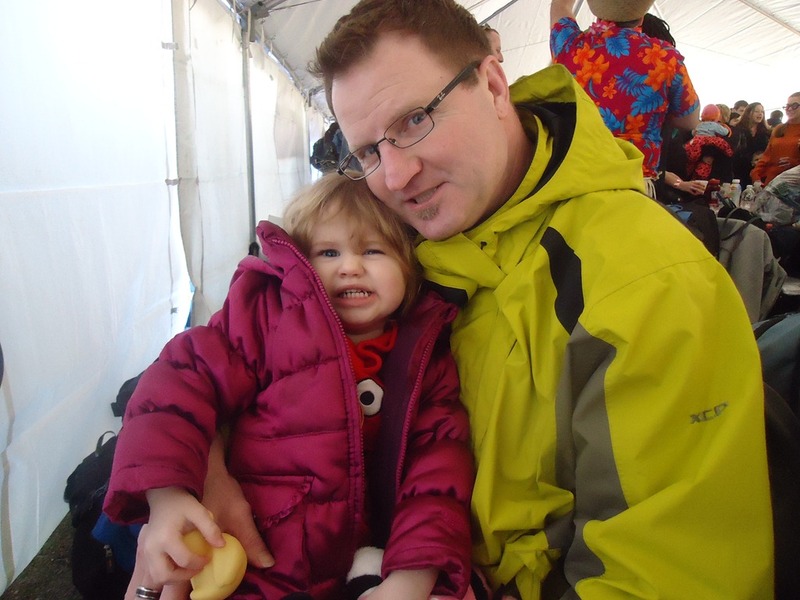 The Polar Plunge is a yearly event that sets out to raise money for Special Olympics. 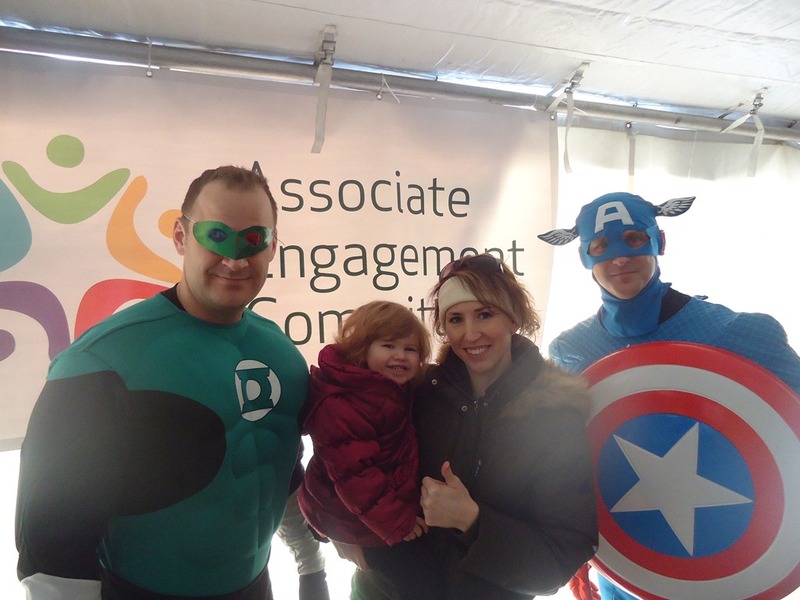 My work put together a company team of nearly 200 people and I was suckered talked in to participating. 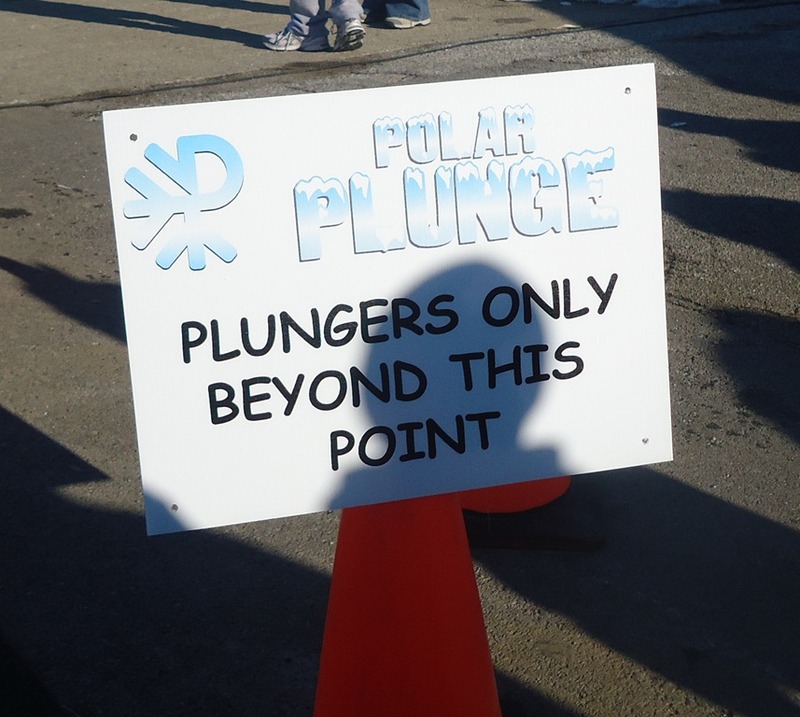 The plunge started at 11 a.m. and we were told to arrive between 9 and 10 in order to get decent parking and breakfast. There were 3 or 4 tents and my company had its own because by far we had the largest group of jumpers. 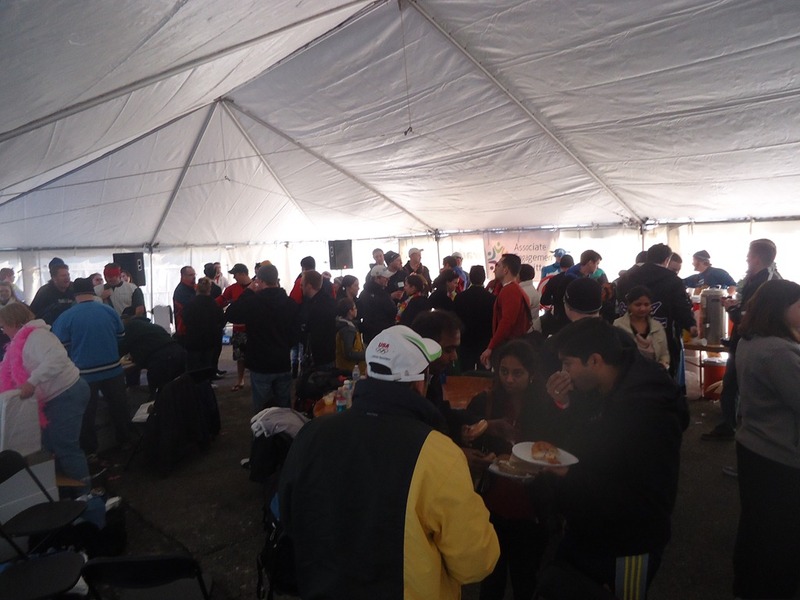 The tent was heated but with all the people coming in and out, it was still chilly. 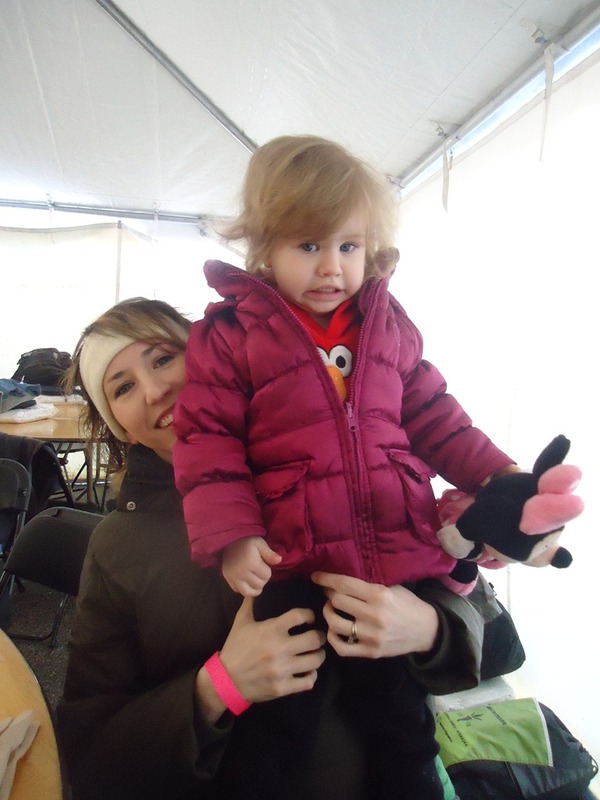 Isabella was a bit overwhelmed by all the people there. It was a lot to take in! What she did like were all the characters present. 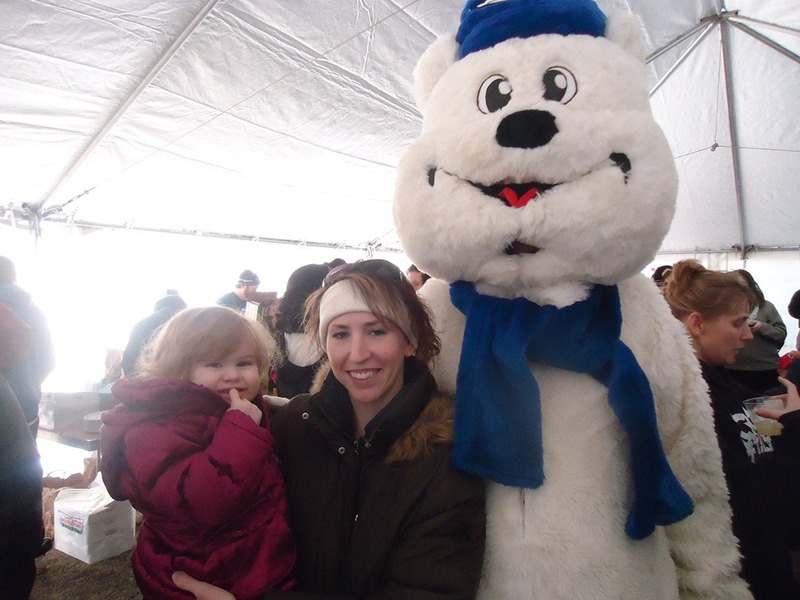 This polar bear was the official mascot of the plunge. I don’t think they intended to be entertainment for the kids but they sure were for Munchkin! We sat around for about 90 minutes waiting for the games to begin. 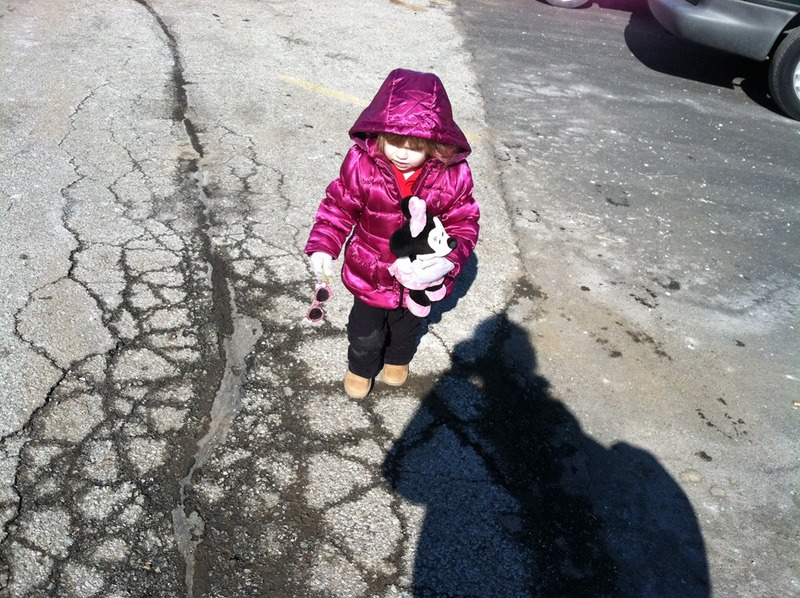 Isabella started getting antsy but for the most part she did a great job! 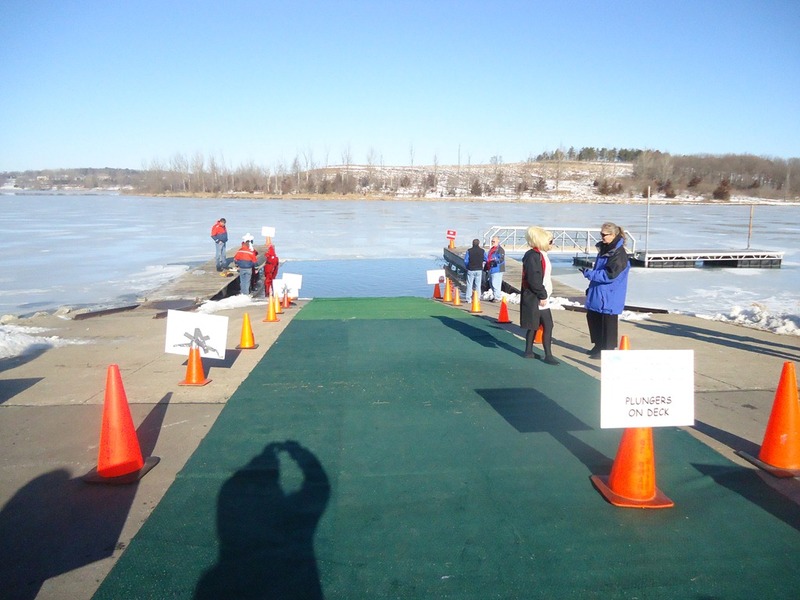 Here’s the ramp leading to the water. We basically start at the orange cone line and head in from there. 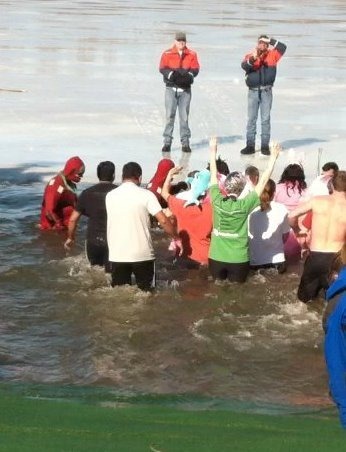 A common misconception about the Polar Plunge is that you actually have to jump in the water. In fact, it’s just the opposite. There are signs all over the strictly forbid diving, splashing or running. Because the water is so cold (probably around 20 degrees) they want it to be orderly and safe for everyone. 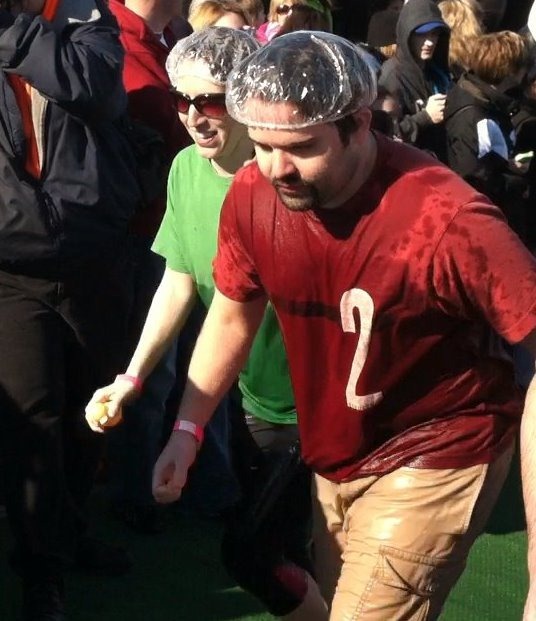 As part of my shtick, I wore a shower cap and carried a rubber ducky with me. Next year some of us are going to get together and come up with a group theme like some of the other folks did. 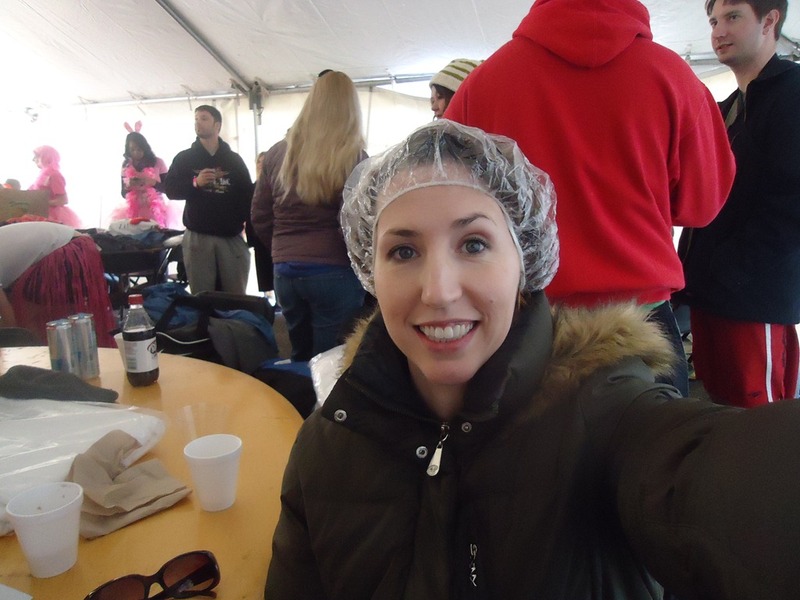 But since it was my first year, I didn’t really plan for much more than the shower cap! At precisely 11 a.m., we headed outside to get started. I stripped out of my warm coat and pants because I was only going to wear a t-shirt and running pants for the actual plunge. The worst part was standing around waiting for your turn because it was cold and my nerves started to creep up. I started having second thoughts and wondered what in the world I was thinking when I signed up to do it. Then, next thing I knew, they were calling my group and it was time to run in! 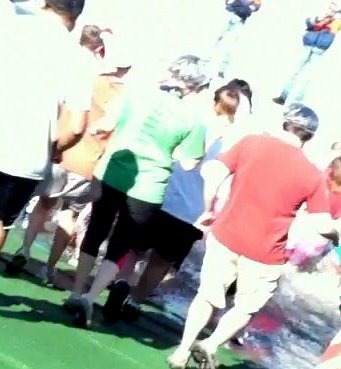 I’m the one in the green shirt with the shiny head. It took a while to feel the cold. At first it didn’t seem too bad at all! Then the frigid waters hit my, um, sensitive area ifyaknowwhatimean and HELLO! THERE IT IS! We had to run out to a dummy set up on the edge of the ice and then turn around and come back. The whole thing took about 20 seconds. The worst part was getting out of the water. Once the cold air hits the frozen water on your body everything goes numb. You can see in the above picture that I only got wet up to my chest. That was enough though! They explicitly instruct you not to put your hands underwater because if you do, they would be too frozen to get your wet clothes off when you’re done. It’s quite tricky doing the clothing change. For one, there are like 50 women shoved in this tent all franticly trying to peel off they’re frozen clothes as fast as they can. Then of course there’s the challenge of peeling off wet sticky clothes, drying off your skin and putting new dry clothes back on. There’s no way to do it fast. And forget about being modest. You have to pretty much strip down naked as fast as you can. No one really looks or cares. They’re too worried about their own frozen toes. When I came out, I saw CJ and Isabella coming toward me. That sight warmed me up more than my wool socks. 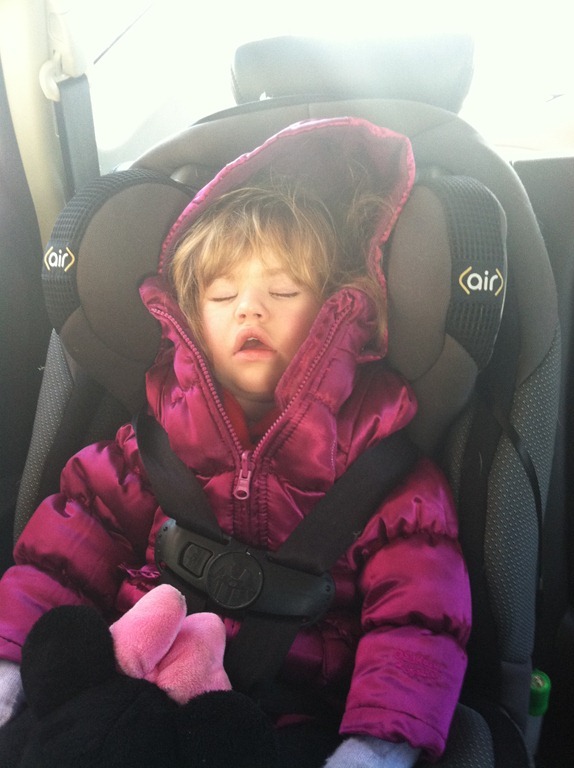 The whole thing wore Isabella out more than it did me. 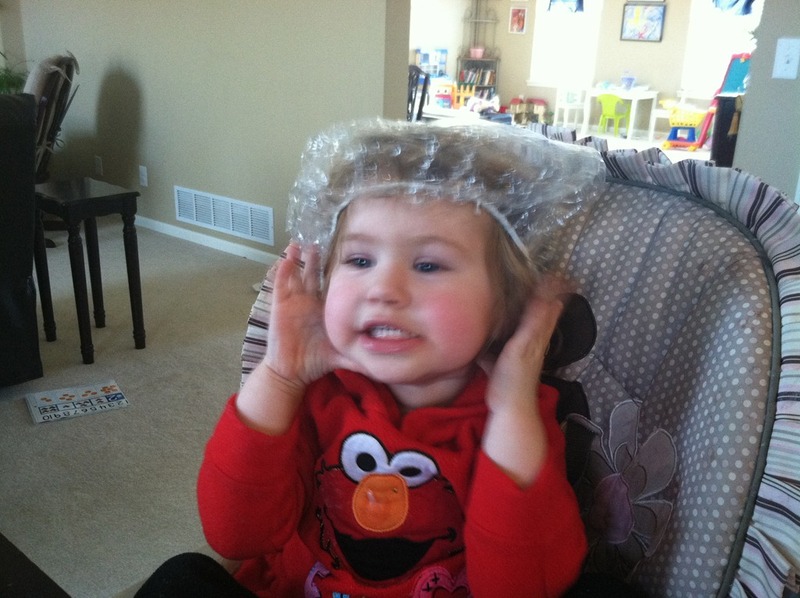 She also enjoyed wearing my shower cap. All in all I’m glad I did it. The whole experience was a lot of fun and the actual going in to the frozen lake part wasn’t nearly as bad as I anticipated. I will definitely do it again! Here is a link to the local news coverage of the event. You can see me and my green t-shirt pop up real quick in a few of the shots.